A nineteenth century thriller tale of John Moore, a crime reporter, and Dr. Laszlo a criminal psychologist who team up to hunt a serial killer active inNew York City. A historical detective show with a modern feel to it. 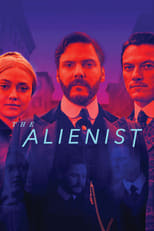 Where can you stream The Alienist? On 2018-01-22 Drama/Crime TV Series The Alienist first aired on TNT. Written and created by Cary Joji Fukunaga, and produced by Anonymous Content & Paramount Television, The Alienist will return and was last broadcasted on 2018-03-26.